This course offers insights and strategies to make the case for policymakers, inspire communities, and build a movement toward healthier, more active cities. *The below program is tentative and subject to change. CLICK HERE TO REGISTER - The fee for this professional development course is $525. The fee includes light breakfast, lunch, course materials and standard bike rental. Electric-assist bicycles can be rented separately through the Bike Hub for an extra fee. 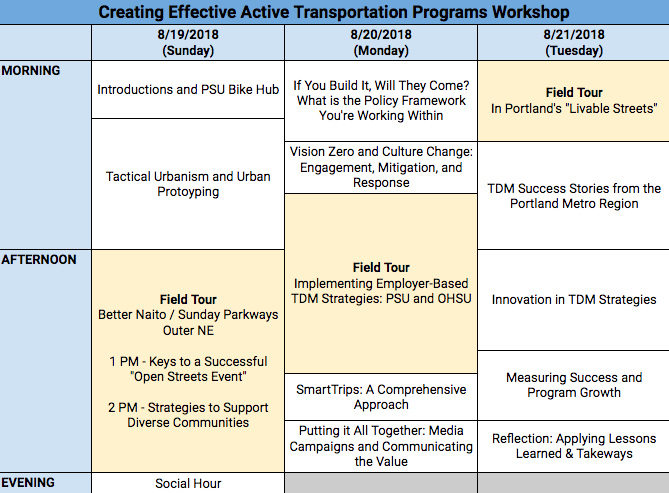 ON-CAMPUS HOUSING: Participants in this Creative Effective Active Transportation Programs workshop are eligible to register for housing in PSU residence halls for a rate of $68 per night. This registration portal will be open until 14 days prior to the check-in date or until the rooms fill, whichever comes first.